You didn’t think being an MBA would be this busy. On top of it all, investment management recruiting seems like it’s just around the corner. After a summer of congratulations, parties and goodbyes, you’ve arrived on campus ready for your next journey. You’ve heard that business school is like a 2-year vacation. But you soon find out it’s not the case at all. In fact, it’s the complete opposite. You are overwhelmed with classes, networking, social events, and school trips. Yet the recruiting frenzy is already starting, and you haven’t even been in school for a full semester yet! It’s part of the MBA experience. After all, getting into investment management was one reason for coming to business school. Recruiting for investment management in business school is like doing a 2-year start-up. I’ve walked in your shoes, and I know how busy and intense it can be. Your recruiting goal is clear, but how to get to the finish line is confusing. Let’s demystify the investment management recruiting process to give you the clarity and the confidence to succeed. Your investment management recruiting timeline for internships and full-time. How to pick your investment style and develop your list of target funds. How to approach career treks and investment competitions. Concrete networking and recruiter outreach strategies. Essential elements to put on your resume and cover letters. How to approach your investment pitch. Both the on-campus and off-campus interview process. If you have any questions about this guide, feel free to post an anonymous comment below and I’ll get back to you. Sept. Get acclimated in school. Enjoy the new environment. Make life-long friends. Oct. Decide on your investment management career preference and the types of funds that fit you. Nov. Join career treks and investment pitch competitions. Dec. Prepare your resume. Develop your investment pitches. Prepare for interviews. Jan. Finalize investment pitches and interview prep. Jan. – Feb. On-campus interviews for internships. Feb. Identify off-campus funds to target. Network to ask for internship opportunities. Feb. – May. Off-campus recruiting – info calls and on-site interviews. Jun. – Aug. Summer Internship. Sept. – Oct. Keep in touch with your summer employer. Network with more funds. Oct. – Dec. Potentially do a part-time internship while in school. Dec. Update your resume. Develop new investment pitches. Prepare for interviews. Jan. – Feb. On-campus interviews for full-time. Feb. Network with more funds to ask for full-time opportunities. It’s daunting, I know. But you’ll have 2 years to do this. We’ll take it one step at a time. First, let’s decide on your investment style to know which funds you should recruit for. Don’t try to be all things to all people. Think deeply about your own investment style, and only target the funds that fit you. Are you a red-blooded macro trader or a long-term value investor? Find funds that fit will not only boost your chance of getting interviews. Being at the right fund will make you a happier person in the long-term. Equity vs. Debt: Which asset class do you want to focus on? U.S. vs. International: There are more job opportunities among U.S. based strategies, but being an international specialist would give you differentiation. Fundamental vs. Quantitative: Do you love researching business and industry trends, or doing big data analysis to identify and predict market patterns? Value vs. Growth: Do you get satisfaction out of identifying catalysts that propel businesses to the next level, or valuing businesses to find the undervalued cigar-butts? Small Fund vs. Mega Funds: Mega funds typically offer brand recognition and job security, while small funds offer higher risk and reward in career trajectory and compensation. Mutual Funds vs. Hedge Funds: Mutual funds and hedge funds differ in terms of breadth of coverage, stability, culture, and compensation. In general, hedge funds have more intense culture and higher pay. Going on career treks, being part of the investment management club, and participating in investment competitions will help you narrow down your preferences. It’s an iterative process. Your investment management club offers on-site visits to asset managers and hedge funds each year. The club will ask for volunteers to lead a trek. I highly encourage you to become a trek leader if time allows. As a trek leader, you pick the funds that are interesting and will directly coordinate with portfolio managers and analysts. Leading a trek is also a bullet point that demonstrates your passion for the industry on your resume. Enter at least one investment pitch competition. It’s a great way to develop your investment pitch for recruiting, which you’ll need to do anyway before the interview season starts in January. You’ll get to present to an industry panel and receive professional critique on your pitch. It’s another great point to add to your resume. Career treks and investment competitions will also help you firsthand to decide on your investment style. Having decided on your investment style, the next step is to develop a list of funds to target your recruiting. Start a networking tracker in Excel. This is your personal CRM. You’ll be doing a lot of networking with alums and recruiters through email and LinkedIn over the next 2 years. Tracking your progress with a database is essential. Here’s a networking tracker for you to use. I also included a list of interview questions to expect. Where else can you find target funds to network with? Start with your peers in the investment management club. Talk to students who come from investment management looking to make a career transition. Speak to second-year students to find out which firms interview on-campus. Ask them which alums have been helpful to students. Reach out to recent grads who have made the jump to the buy side. Through the career center, you’ll also have access to at least one company research platform among Bloomberg, CapitalIQ, FactSet, and ThomsonONE. Use the company screen tool to generate a list of funds that match your preference in terms of location, assets under management, and strategy. Use online sources to identify top funds. Institutional Investor’s Alpha Magazine has a list of the Top 100 Hedge Funds. The Vault guides also have lists of top hedge funds and mutual funds. When you can’t find fund contacts in the school alum database or on LinkedIn, use public filings. Go to the SEC Investment Adviser Database to search the name of the fund. You will find the contact information of the fund and the CFO. Next, get intimate with your school alumni database. This is will be an important asset throughout your career. Search for alumni companies that include the words “fund”, “capital”, “partner”, and “investments”. Visit the website for each fund to research its strategy and your alum’s profile. If the fund fits your investment style, put it into your networking tracker and email the alum for an info call. Most business school alums are very helpful to current students. They started their investment management career the same way you did, networking through their alum database. They’d love to return the favor when they see a current student reaching out to them. My name is [X] and I’m an MBA student at [School]. I found your contact in the alum database while doing research on [Company], and I’m wondering if we could chat over the phone to learn more about your experience there. I am passionate about pursuing an investing career and I’m wondering if I could get your advice on how to build a career in the industry. Prior to starting my MBA, I worked in [XYZ]. I’ve also participated in the [X] investment competition, which reaffirmed my passion for investing. Thanks [Alum], I have also attached my resume for you. I look forward to hearing from you. Always attach your resume. Your alums don’t mind, because they know that you are trying to find a job. Also, attach your investment pitch if you have it ready. We’ll go over how to prepare your pitch below. Besides your school alum database, make heavy use of your LinkedIn network. You’ll have many second and third degree connections in the investment management industry through your current contacts. Connect with them on LinkedIn, and mention your mutual contact in the email. Mentioning your mutual contact is key to getting a higher response rate. After you make the connection, send either an email or a LinkedIn message. I recommend using email. It’s more formal, and you won’t know how often your contact checks LinkedIn. Similar to alum outreach, use an email template. You’ll be sending multiple emails a day, and it’ll quickly become harder to track your progress. Use the network tracker to schedule calls, update your progress, and keep notes. It’ll be a lifesaver. Also be mindful of your success rate. Are you getting a higher response rate using a particular email template? Do you get more replies from a particular type of fund that’s interested in your skills? Besides your alum network and LinkedIn, another piece of the networking trifecta is recruiter outreach. 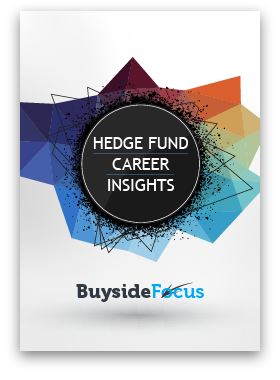 There are thousands of hedge fund and asset management recruiters out there, ranging from tier-one firms such as Glocap, Pinnacle, Mercury, Heidrick & Struggles to the single-recruiter shops. In the Hedge Fund Recruiting Roadmap, I talked about spending only 20% of your time on recruiter outreach. Recruiters work for their buy side clients, not us. Each recruiter has only a handful of active engagements going on at any given time. They spend 100% of their time on searching for candidates to fill these roles. If you are not a fit, they won’t respond. They don’t represent us. Instead, focus on improving your LinkedIn profile. LinkedIn Recruiter is a primary method for recruiters to source their candidates. Beef up your LinkedIn profile by injecting targeted keywords that recruiters would search for. For example, if you are recruiting for long/short funds and you know the healthcare industry well, have those keywords in your profile summary and work experience. If you are recruiting for macro funds, put the keywords “currency”, “FX”, “interest rates”, “derivatives” into your profile. Let’s do a test. Pretend that you are recruiting for high yield analyst roles. Register for a new LinkedIn account to search for “high yield analysts”. Which page do you come up on? If your name shows up on page 20, then chances are that recruiters won’t be able to find you. You should your strengthen your LinkedIn profile by injecting keywords and making more connections with high yield analysts and portfolio managers. Prepare your resume and cover letters in late November. The goal of the resume is to demonstrate that you have the hard financial analysis skillset, and the goal of the cover letter is to demonstrate that you have the qualities to make a good investor. Business valuation using discounted cash flows and multiples. Show that you’ve built comprehensive 3-statement models. Company due diligence through discussions with management and industry contacts. Describe M&A transactions or research projects where you’ve dealt extensively with senior management. Expertise in a particular industry or geography. If you are a consumer retail analyst or Asia expert, list companies and projects to showcase your expertise. Most investment managers prefer analysts with an area of expertise that complements their current team. However, some funds do look for generalists that can be the jack-of-all-trades. So prepare multiple versions of your resume. Have a specialist resume to showcase your area of expertise, and another one for generalist roles. Target your resume to your audience. The cover letter is a written description of your resume. Don’t stop there. Also demonstrate that you have the qualities that would make you a successful analyst. Emphasize that you are intellectually curious about businesses and markets, entrepreneurial, and a risk-taker. Learning Opportunities: I have a natural curiosity to learn about industry dynamics and business strategies. Covering a range of securities and making investment recommendations at [firm] would satisfy my intellectual curiosity. Entrepreneurial Environment: I love being in an entrepreneurial culture, where I can proactively add value by performing independent analysis and discussing with the team to draw investment conclusions. These bullet points convey that you understand what it takes to be successful in investment management and that you have these qualities to succeed. Most on-campus interviews ask you to submit a sample investment pitch. You should also attach the investment pitch to all off-campus recruiting opportunities as a sample of your work. The investment pitch should be 2 – 4 pages and no more than that. A pitch too detailed is hard to digest for an interviewer going through hundreds of resumes. Company: A brief description of the company’s business model and attractiveness. Talk about its industry position, product portfolio, points of differentiation, business segment, geographical exposure, competitors, customers, and suppliers. Investment Thesis: Why is this company worth investing in? Typically, there are 3 major aspects to driving a stock’s upside: the company’s quality, upcoming catalysts, and valuation. Is it a high-quality business that will generate superior returns over competitors in the long-run? Does it have upcoming catalysts that likely lead to an earnings beat? Is the company undervalued compared to peers? Use these questions as starting points to form an investment thesis. Furthermore, focus on how your assumptions are different from others’. What do you see in the company’s quality, catalysts, and valuation that sell-side analysts don’t see? Valuation: Present your model and explain your assumptions. This demonstrates that you can value businesses and forecast scenarios. You need to show that the company is either undervalued for a value pitch, or is reasonably valued for a quality-at-reasonable-price pitch. Risks: What can go wrong that negates your investment thesis ? Every investment is a calculated risk, and for every potential upside, there’s a possible downside. Talk about these risks one by one to show that you’ve considered them. Ideally, prepare 2 – 3 pitches. Include a short pitch if you are targeting long/short funds. Align the pitch with the fund’s strategy. Pitch a large cap stock to large cap funds, and pitch shorts only to long/short funds. Practice delivering your pitch to friends. Investment competitions are also perfect venues for a live audience practice. If your investment management club has a student fund, that’s a good place to practice your pitch as well. During October to December, you’ll find out which funds will interview on-campus. You’ve have prepared your resume, cover letter, interview script, and investment pitch. Before the on-campus recruiting process begins, study the funds and learn about their culture and process. Reach out to students who have gone through these interviews to develop your interview strategy. Network with alums at these funds ahead of time to ask for info calls. Learn about the funds’ investment process, culture, and what they look for in an analyst. Use your networking tracker to manage your list of target funds, take notes on your calls, and develop interview scripts. Your goal before each interview is to know exactly what the firm is looking for, what they’ll ask, and how you will answer. On-campus interviews usually consist of 2 to 3 rounds. The first round is at the career center and typically consists of 1 interview for boutique funds and 2 interviews for mega funds. There will definitely be an investing-related interview. For mega funds, typically an HR person will conduct a second behavioral interview. The second round will be in-office and range from 4 interviews all the way up to 10. The purpose of this round is to thoroughly assess both your fit with the fund and your technical skills. The reason for the marathon interview super day is two-fold. One, to make sure that you fit with everybody on the investment team. Two, to test your work stamina. A third-round is the case study or investment pitch. This could be combined with the second-round if the fund is constrained on time or budget. The pitch could range from an informal one-on-one Q&A session with the portfolio manager, or a firing-squad style presentation in front of the entire investment committee. The fund could either give you a name to present or, if you are lucky, you could get the opportunity to pick a company you are familiar with. Don’t worry if you don’t get an offer from on-campus interviews or not many funds come to your school. On-campus interviews are only a small fraction of your recruiting process. The vast majority of investment management recruiting is done between February and May after on-campus recruiting is over. Off-campus recruiting is as busy as doing a start-up in school. You are essentially building your products: interview prep and investment pitches, and out in the field promoting the business of you. Time management is key. Be efficient with your job sourcing. Eliminate job boards that don’t have quality buy side postings. Start with your school’s off-campus job board, which will give you a high hit rate since the funds are specifically looking for talent at your school. Besides your school’s job board, here are 7 Best Source to Find Buy Side Jobs for you to utilize. From experience, these job boards offer the highest quality buy side job postings. Keep adding to your list of target funds. For each job posting, find a potential contact to network with, whether through your alum database, LinkedIn, or public filings. You have more resources than you think. Use your networking tracker to take notes and keep track of your interviews. Off-campus interviews are similar to the on-campus process, except that the first round is a phone interview. Some info calls can turn into an interview right away. Be prepared, and approach each info call as if it were a first round phone interview. Again, your goal before each interview is to know exactly what the firm is looking for, what they’ll ask, and how you will answer. It’s perfectly fine to not have found an investment management job by the time you graduate. In fact, most people won’t by this time. Don’t stress out, and enjoy your graduation. In the Hedge Fund Recruiting Roadmap, I talk about the recruiting cycle revolving around the bonus season, which is between January and March. Unfortunately, MBAs graduate in May to June, creating a mistiming between supply and demand. Keep your head up, and keep recruiting. Most people will find something by year-end. Things will work out, I promise you. Good luck, and enjoy your MBA experience. From one MBA to another, I truly wish you the best two years ahead! I’ll answer your questions below. I have offers from both large and mid-sized hedge funds. How should I choose?